Farhan Akhtar is a handsome young man who would not look out of place shaking hips with scantily clad girls in Bollywood blockbusters. 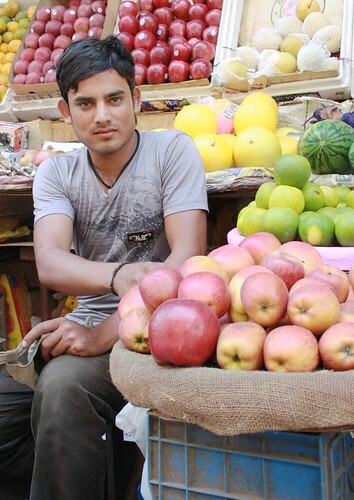 But for now our hero is selling fruits at a stall in Daryaganj’s Sir Sayyed Ahmed street. And for someone who never misses his namaaz and has Aital Kursi as his mobile phone call tune, it must be a God-gift to live this kind of honest, hardworking existence. Each night Mr Akhtar hires an auto to Azadpur sabzi mandi, Asia’s largest wholesale vegetable market. It is in north Delhi, an hour away from Daryaganj if there is smooth traffic. 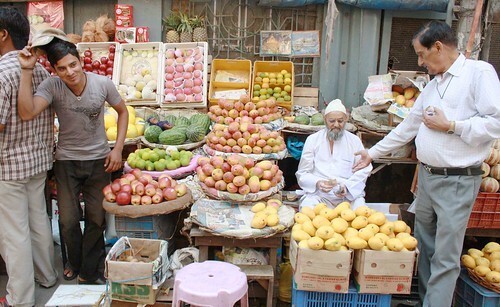 There Mr Akhtar purchases fruits that come daily from all over India, and the world. The choosing, picking and buying of different varieties of apples, mangoes, pomegranates, melons, grapes, pineapples is a long, exhaustive business and Mr Akhtar manages to return only as the dawn starts breaking behind the Red Fort’s ramparts. However, Mr Akhtar’s ‘day’ is still not over yet. He has to hand over the fruits to the stall owner, run by a polite old mullah, and then only he goes home to sleep. 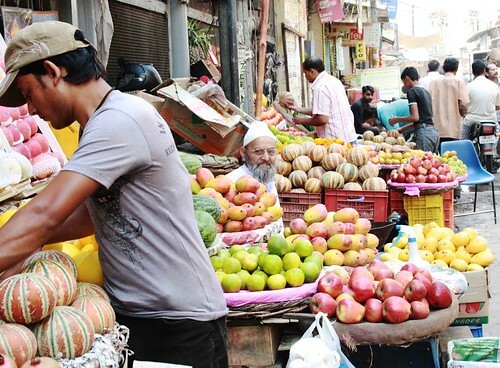 A few hours of bed rest there and then Mr Akhtar hops back to the stall to claim a commission on the fruits sold till that hour. 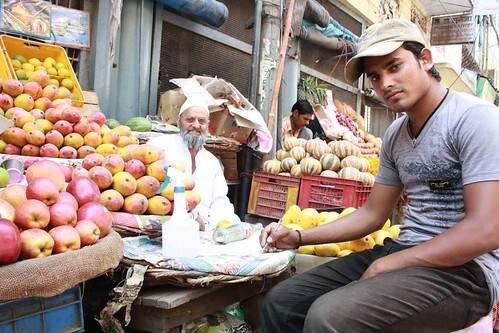 This hectic pace enables Mr Akhtar to make a daily earning of Rs 200, sometimes even more, sometimes also less. While Mr Akhtar dabbles in pricey apples imported from lands as far as China (Rs 120/kg) and Washington (Rs 110/kg), he himself is very budget conscious about what he eats. True, he likes meat but mostly he patronizes an inexpensive vegetarian eatery called Shankar Dhaba in Kuchal Paramal. It is good there – one plate of Shahi Paneer comes for as low as Rs 10. However, these cost-cutting measures coupled with a deep sense of duty towards old parents doesn’t mean that Mr Akhtar knows no fun. He hangs out in Connaught Place, watches films in a friend’s DVD player, sing Bollywood numbers, guzzles down bottles of Coke at one go and yes, he loves Kashmiri apples (Rs 70/kg). The Delhi Walla wishes him a happy life. mullah drinking coke is priceless! he is awfully goodlooking, this big-eared fruit-wallah of yours! Are you gay Mayank? When will you start interviewing girls or you fail to find extraordinary girls in Delhi? Is there a reason you chose this handsome young man as your subject, Mayank? You wannabe Muslim its not Aital its ‘Aya’at Al Qursi’. @ Rima Kaur: A Mullah drinking Coke shouldnt be alamrming. If you think just cause you can read “Coca Cola” in front of a mirror and contour it a bit to make it read “La Allah” (No Allah -in Arabic)is just a piece of perverse imagination and thinking; Considering one of Asia’s largest bottleing plant for Coca Cola is in Riyadh – Saudi Arabia!! Just discovered your blog – I have to say I love the pictures! And curiously, it even seems you know some of the same people I know. Small world. bruised indian – i said its priceless; i didnt say its funny or impossible or against islam. i would have found it priceless even if there was an akali wearing a towering turban in his place. its interesting for me to see something so traditional intermingled with something so new. whats the harm in it? i dont know why every comment, book, photo, thought out there is considered anti-islam. i say something as simple as “mullah drinking coke is priceless”, and hell breaks loose. accha hoga mayank that i stop commenting on your blog and keep myself content by just reading it. the demons are in your mind, my friend. i did not even know about these subliminal messages. sorry i didnt mean akali. i meant nihang. I really love Indian Manggoes specially from Salem disrict Tamilnadu. Nice pic. It is an Ayat or para of the holy Quran which is invoked to ward off danger, bad demons, bad times etc. Moms & grannies often recite it so that the children stay out of danger. 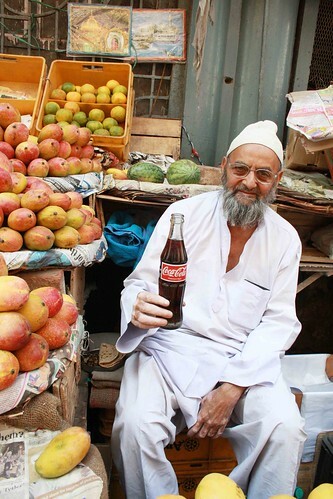 I am amused by some people’s idea of “Modern”…my dad in his youth in the 50s would be drinking the stuff all over india..
No wonder you first initiated the “Mullah With Coke – Priceless” cliche!